Welcome to Old Sturbridge Village – an outdoor living history museum depicting life in an early 19th-century rural New England village, featuring costumed historians, artisans and farmers; historic homes, trade shops and water-powered mills; a working farm with heritage breed animals; and permanent and rotating exhibits. We recommend allowing at least three hours to tour the Village, though many stay for the day. Please check our hours of operation before planning your visit! While service animals are allowed in the Village, we regret that pets are not allowed. Members are allowed to bring their dogs on designated Dog Days. No weapons are permitted on Old Sturbridge Village’s property with exemptions from this policy to include all law enforcement agents. Silence all mobile devices to help us preserve the 1830s experience. Please do not touch or feed the farm and wild animals! Walk carefully on the Village’s natural roadways. Please do not walk or climb on fences, stone walls and trees. Eating and drinking is not permitted in historic buildings and exhibits. Smoking is not permitted in the Village. Tripods and selfie-sticks are not permitted. Soliciting is not permitted unless authorized by management. Photography in Old Sturbridge Village is permitted for personal use only. By entering the museum, you agree to the use of your image for publicity purposes. What is Old Sturbridge Village? Old Sturbridge Village is an outdoor, living history museum and learning resource that invites all visitors to find meaning, pleasure, relevance, and inspiration in the exploration of New England’s past. It is a nonprofit, educational museum that is open year-round. The centerpiece of the museum is a re-created rural New England town of the 1830s set on more than 200 acres of historical landscape, encompassing a Center Village, Mills Area, and Countryside. Read more about us. Why are there people walking around in old-fashioned clothing? Are they Puritans or Amish? 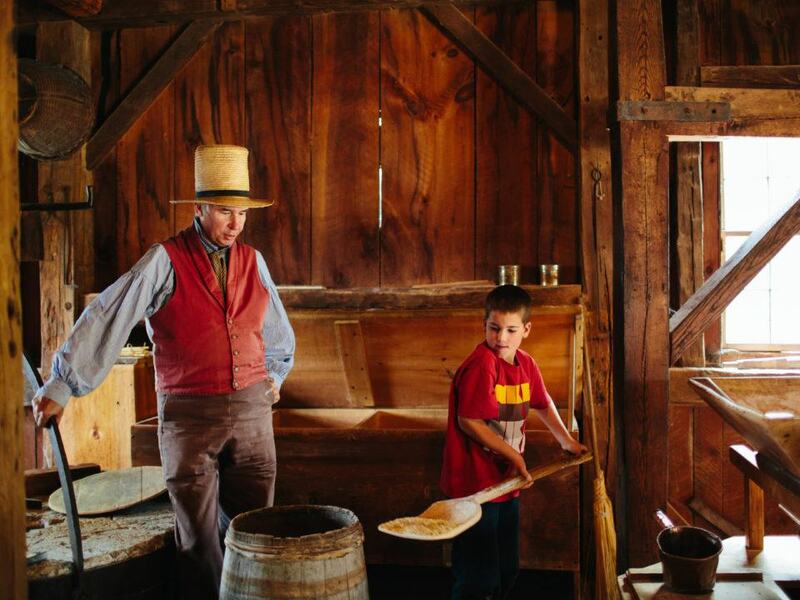 When you visit Old Sturbridge Village, you will see costumed historians (sometimes called “interpreters”) throughout the Village, working in trade shops, on the farm, or cooking in front of a fire. Even though they wear clothing like people wore in the 1830s, they are just like you, but they know a lot about New England history. They are not acting as a character or pretending to be a person from the past. They speak in the present tense and can help you compare life in the 1800s to life in the 21st century. Most of them are paid staff members but also some are volunteers. Don’t be afraid to ask them lots of questions! They will help to enrich your experience of the past. You can check our current and upcoming hours here. You can learn more about daytime admission here. While a typical visit averages around three hours, many visitors choose to return for a second day. In this case, you may want to purchase a Season Pass, which pays for itself and more in just two visits! Where can I eat at Old Sturbridge Village? 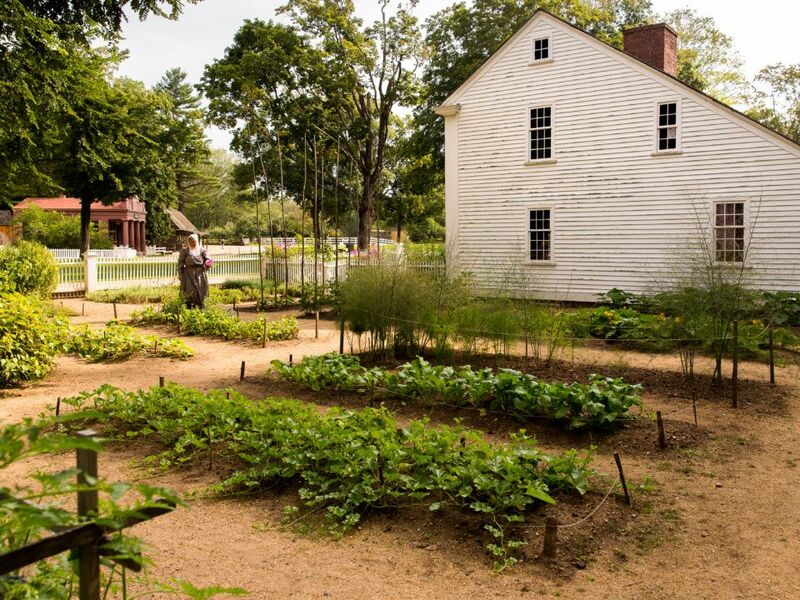 Several dining opportunities are available for visitors to Old Sturbridge Village. Are wheelchairs available for touring the Village? Are overnight accommodations available at Old Sturbridge Village? The Old Sturbridge Village Inn & Reeder Family Lodges are located adjacent to the Museum and overnight stays include discounted admission to the Village. Read more or make reservations online. Yes. There is plenty of free parking, with spaces reserved for larger vehicles. While there are no facilities for overnight camping at the Village, there are a number of nearby campgrounds. For more information, visit the Sturbridge Townships website. 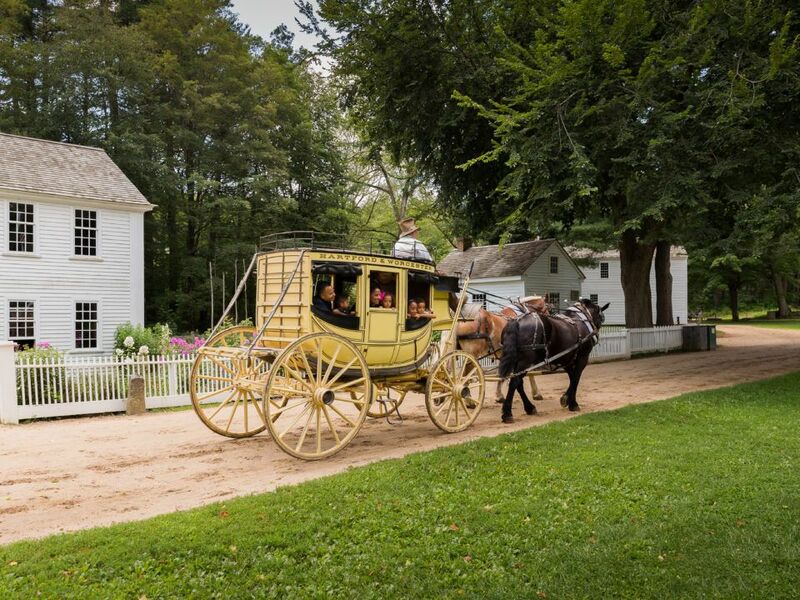 What's happening today at Old Sturbridge Village? Check a list of timed performances, demonstrations, and more at the Village here.